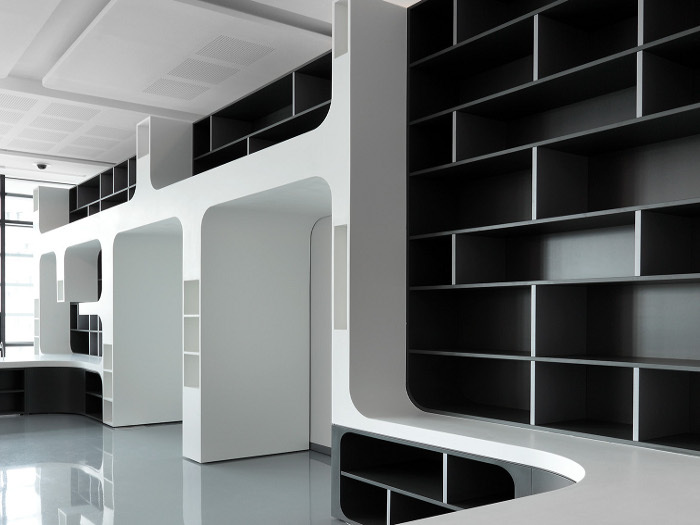 In his role as project architect at Zaha Hadid Architects, Stephane Hof spent many years designing the Pierres Vives government building in Montpellier, France. Now, after setting up his own practice, Hoffice, he has designed the interior of the building's reading room too. The municipal building houses a multimedia library, public archive and sports department of the Herault regional government and also has a reading room, which is open to the public. But where the Pierres Vives itself took nearly a decade to complete, the reading room had to be finished in a mere three months - a time frame that demanded a simple yet affective design scheme. The result is a bold, modern scheme made of curvilinear forms and strong contrasts of light and dark. It should come as no surprise, given Hof's involvement in the building's overall design, that the resulting interior has a pleasing synergy with the Pierres Vives's exterior, whose architecture also juxtaposes soft curves and shelf-like straight lines. Shelves and window seats curve gently around the room, while the use of just two materials - dark wood and white Corian - creates a strong contrast that mirrors that of the concrete and green glass of the exterior. 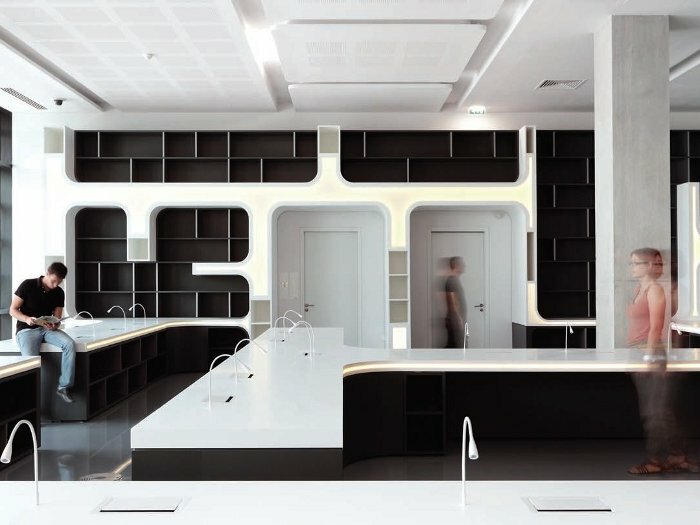 Given that this is no ordinary-looking building on the outside, Hof decided to break away inside from traditional ideas of what a library should look like - creating instead something more like an modern laboratory. 'They wanted a space that was inviting, that was different and that was the brain of the building, says Hof. 'In some ways it's quite complex and in others it's quite simple. 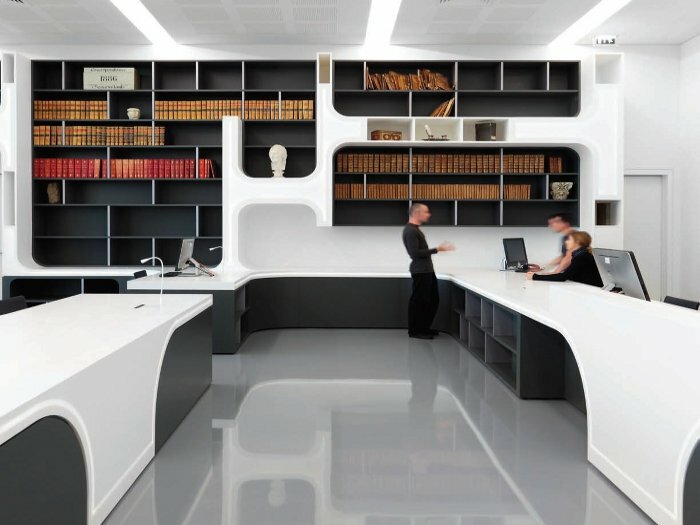 The curvature of white Corian-topped tables mirrors that of the library shelves, which Hof says are designed to evoke the shapes of letters of the alphabet - forms such L-shapes, H-shapes and T-shapes can all be seen in various abstract ways in the final design. Each table space has its own reading light, but Hof has also backlit panels of translucent white Corian on the walls to give the space a more intimate feel after dark. Praised by architecture critics, Pierres Vives is an exemplary municipal building, both inside and out, but it is also the kind of project we are likely to see less of as the age of austerity continues across Europe.